Halfway Woldstraat lived Eleazer Wolff together with his son, daughter-in-law and grand children. Eleazer was born in 1879 and married Schoontje Denneboom (born in 1867) in 1899.They had three children: David (1909), Jozef (1899) and Frederika (1902). Schoontje died in 1933. Frederika and Jozef stayed in Meppel, David left his birth place. Frederika married Meijer Kan, a trader in scrap metal and rags. They first lived on Bloemendal and later on Molenstraat. Jozef (named Jo) was a merchant and was married to Miena Leman (born at Avereest, 1908). Mien, a seamstress ,was one of the six children of Abraham Leman and Betje Davidson from Avereest. The family lived at 46 (currently known as) Meppelerweg. She was a very smart, progressive type with a great creative talent. Mien was a ‘qualified costumier’ by profession with a ‘cutting studio', where she not only cut patterns, but also gave lessons in cutting to size, ink prints, batik and other paint techniques. 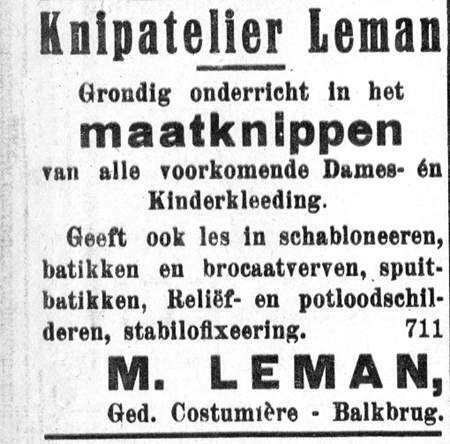 In an advertisement in the Dedemsvaartsche Courant of the 12th of April 1930 she offered her services. On the Queen’s birthday ( the 31st of August in those days) she made roses from orange wool, which she sold for a few cents to people who wanted to wear them on their clothes. She would hand the proceeds of the sales to a fund that served the interests of Jews that were being pursued in Germany. In 1933 she moved to Meppel, because she got married to Jo Wolff. Advertisement of the taking out of a marriage licence of Jo Wolff en Mien Leman. Before her marriage Mien Leman had a cutting studio at Dedemsvaart. 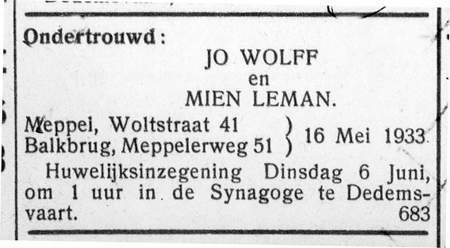 The Dedemvaartsche Courant reported that Jo and Mien were married in the synagogue at Dedemvaart on the 6th of June 1933. The couple had three children: Schoontje (born 1934), Abraham (1935) and Eli (1938). 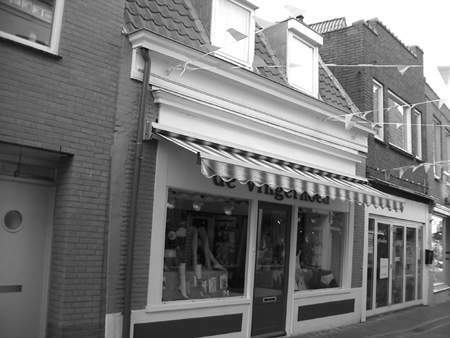 Jozef had taken over his father’s drapery business on Woldstraat. In 1941 the shop was closed and the merchandise removed; later followed the official liquidation by Omnia. On the 20th of July 1942, Jo was taken to the labour camp in Orvelte. Mien stayed behind with the three children and her old father-in-law, aged 83. Jozef possibly came home for a day on leave, but we know that he was transported from Orvelte to Westerbork around the 3rd of October. Meanwhile, in the night of the 2nd to the 3rd of October the Wolff family were taken from their home by Meppel policemen. It must have been terrible for all of them: three young children who did not understand, and who without any doubt burst into tears and screamed, a mother who had to arrange everything (clothes for the children, herself and for grandfather), and an old man who probably could not walk so fast any more. After the door had been shut, and the key had been entrusted to the police, they stood there in the middle of a chilly night, in complete darkness. Around eight o’clock they found themselves with many other Meppel Jews at the station. It has been said so often: from there a single trip to Westerbork. 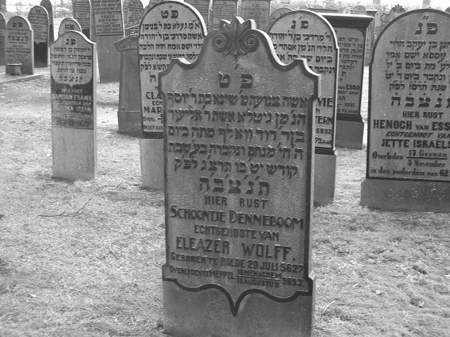 Eleazer Wolff’s wife, Schoontje Denneboom was buried at the Jewish cemetery on Steenwijkerstraatweg in Meppel. In Westerbork the family met Jozef again. Let’s hope that gave them a little bit of joy after all the misery they had gone through. The saddest moment was when Eleazer celebrated his 83rd birthday in Westerbork. The reunion did not last long, because on the 23rd of October old Eleazer was transported to Auschwitz, together with 987 other Jews. Three days later he died. The rest of the family stayed in Westerbork until February. Without doubt they enjoyed now and again the relatively good conditions in the camp during this period. But every week there was the uncertainty again: are we going or are we staying a bit longer. On the 1st of February it was clear: their train would be leaving for Auschwitz on the 2nd of February. The lives of these five young people ended on the 5th of February. Jozef and Miena would never see their children grow up and the three children would never have a chance to make something of their lives. Zyklon-B, a product of the German chemical industry took care of that. David and Frederika (Jo’s brother and sister) and Keetje, Mozes, Betje, Isaac and Meijer (brother and sister of Mien) did not survive the war either.